Balense is the range of high-performance skin care products that we use exclusively at The Cosmetic Clinic. They have been designed to give you fast, visible results and promote healthy, fresh and radiant skin. Balense uses a simple four-step system of Cleanse, Boost, Hydrate and Protect. All Balense skin care products have advanced time-release technology that transfers active ingredients and potent antioxidants onto your skin. This time-release technology allows a sustained and controlled release of ingredients over an extended period of time to ensure your skin is cared for around the clock. These ingredients are delivered deeper into the upper layer of the skin where it counts. Balense skin care is ageless science that gives you a new way to face the world. Please click here to view our current Balense Price List. To find out the right skincare products for your skin and to take advantage of your complimentary skin consultation call today. Our highly experienced clinicians are ready to assist with your unique skin care concerns. At The Cosmetic Clinic we believe that you should keep your home skin care plan simple and manageable. Take your first steps to soft, healthy and glowing skin at The Cosmetic Clinic. The skin consists of two layers, a deep layer called the dermis and an outer layer called the epidermis. The dermis is like the foundations of a house ñ it is invisible and contains all the plumbing services. It is mostly made up of a tough fibrous structure called collagen. The dermis also contains the hair follicles and oil glands involved with causing acne. The outer layer of skin or epidermis consists of layers of cells held together by binding cement similar to the way bricks are held together with mortar. The skin cells are created at the bottom of the epidermis and work their way to the top, progressively shrinking and flattening, becoming cornified and hard. These cells form the outer dead layer of the skin known as the stratum corneum. During childhood the stratum corneum is very thin. The skin is consequently more translucent, allowing light to enter more easily. That is why children have such beautiful looking skin. Unfortunately, as part of the process of maturing during the teenage years, the skin thickens, especially the stratum corneum. The result of this thickening is duller looking skin and for many teenagers the development of acne. If you are ever in a room of adults in the 40 to 60 year age group, compare the skin of most men with the ladies. In general the men have the better skin. Why? There is only one reason – most men shave. In the process they remove the stratum corneum as well as their whiskers. This process is called exfoliation. So, if the reason men tend to have nice skin on the lower part of their face is exfoliation, it makes sense that daily exfoliation for ladies is perfectly safe providing the product does not contain ingredients that scratch and tear the skin. For this reason, products containing ingredients such as Apricot Kernels are not ideal for the face. There are many ways to exfoliate but for home care we recommend using scrubs. We also recommend the use of Glycolic Acid based skin care products because Glycolic Acid softens the binding cement holding the stratum corneum cells together making it easier to remove them with scrubs. 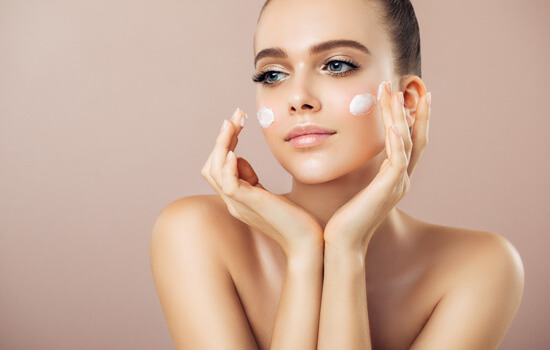 Your skin is constantly changing according to the weather and other environmental issues such as pollution, hormones, the skin care plan you use and the make-up you wear. From time to time its nourishment also needs to change, so we advise you keep in touch with your skin care professional. They will be able to advise you over time about what is happening to your skin. Everyone should apply a SPF 50+ broad spectrum sunblock every day whether they are going to be outdoors or not. There is currently no evidence that sun block can cause any long term skin problems, however there is very good evidence that it can protect the skin from damaging UV rays and reduce the incidence of skin cancers, sun spots and photo-ageing. If you already have damaged skin you may need to have some form of skin treatment such as a medi-aesthetic peel or possibly laser rejuvenation, which can provide excellent results in treating pigmentation, age spots, freckles and more. The right skin care products can also assist and are vital pre and post treatment to maximise results and prepare the skin. The right active cosmeceutical skin care can make a dramatic difference to how your skin looks and feels. It can also assist in generating healthy renewed skin, supporting skin from the inside out which improves elasticity, can fade pigmentation and reduces the appearance of blemishes. 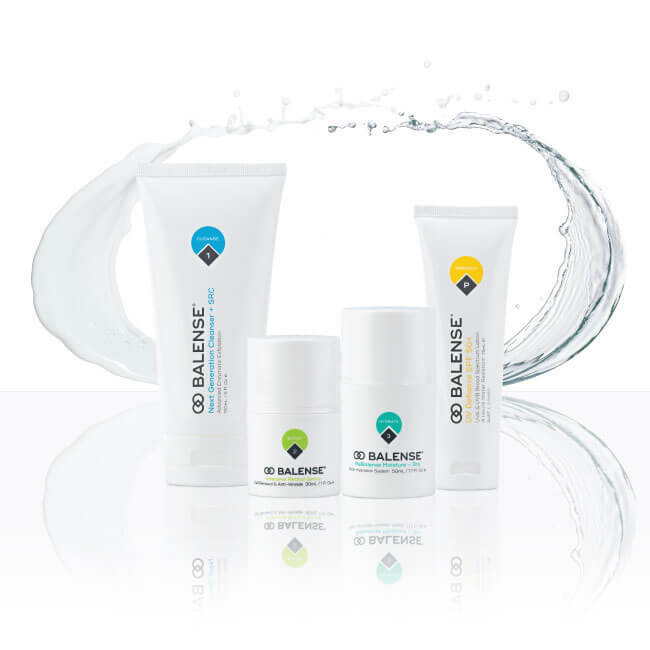 At The Cosmetic Clinic we are proud to provide the Balense skin care range. Skin care should be a very simple matter for most people. 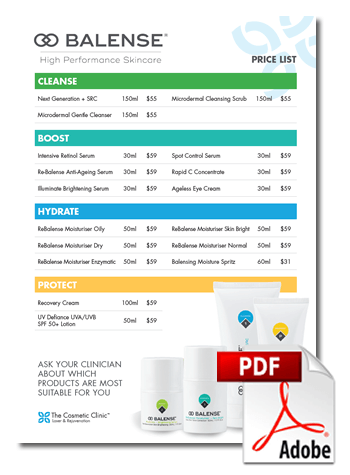 At The Cosmetic Clinic we want to help you get your home skin care plan on track. Healthy and fresh looking skin could be a consultation away. Book your FREE skin consultation today! Contact us now!